WRFER is World's largest Non-profitable professional association registered under India Trust Act(1882) meant for research development and promotion in the field of engineering and technology. WRFER is a paramount body which has brought technical revolution and sustainable development of science and technology. The WRFER-forum constitutes of professional wizards and overseas technical leaders who have left no stones unturned to reinforce the field of science, engineering and technology. The Institute conduct technical conferences, seminars and workshop at different parts of country to reduce the gap between curriculum and their practical implementation among students and research scholars. 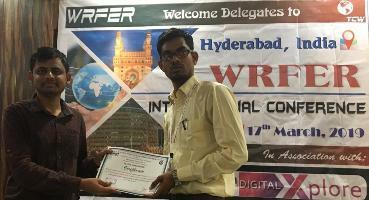 Today WRFER is one of the leading publisher of research papers in its high quality peer reviewed journals, proceeding and research magazine. The Institute provides a brilliant scope of research and development to geniuses and wizards working in the field of engineering by providing financial aids by which economic constraints won't retaliate the technical growth and research development. The institute is supported by its International Advisory Board(IAB) which is not limited to the subcontinent rather we have geniuses from middle east to boost our organization. Today WRFER is collaborated with leading technical institutes including Universities and research centers that promotes the exchange of technical knowledge among our students. WRFER is a non-profitable organization(NPO) that has always emphasized on quality assurance and authentication. The institute conducts technical conferences ,seminars and workshops at different parts of country to reduce the gap between curriculum and practical implementation among the students. Our editorial board consists of highly qualified professionals to publish the research works of research scholars in leading journals with high reputation and a better impact factor. Beside this WRFER is collaborated with leading publisher of world to expose the innovation of its wizards. Last but not the least Institute for Research and Academic Journals (WRFER) is one among the leading institutes of the globe to inculcate technical revolution among scholars, brilliants, geniuses and wizards of different country.